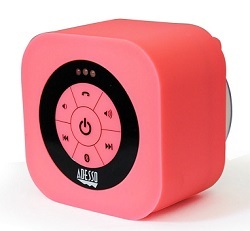 The Adesso Yellow Xtream S1 Bluetooth Waterproof Speaker lets you take your music wherever you go! Small enough to fit in your pocket or your bag, Adesso Xtream S1 delivers incredible audio sound with rich loudness and exceptional treble. The Adesso Xtream S1 has a waterproof exterior letting you listen to your music in the shower, at the pool, on a hike, or anywhere! The built-in Bluetooth microphone adds an extra option to make hands-free phone calls. It is also dust and shock resistant, offering protection from the Earth's elements. Each device comes with a detachable suction cup so you can stick the device on a window or a bathroom wall. You can now enjoy even fuller, bolder, and louder sounds (and answer calls) with a touch of a button.